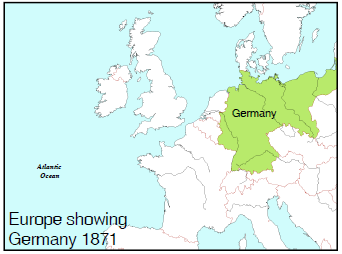 1861-71: Prussian leader Otto von Bismarck united the German states into a nation. Also during these years the German philosopher Hegel promoted the importance of historical determination and group loyalty to the State. This would provide a philosophical base for the development of Marxism and Russian Communism. 1860s: Garibaldi led the unification of Italy by conquering the southern states. 1866: In July the transatlantic telegraph cable reached Heart's Content, Newfoundland allowing messages to be sent quickly across the Atlantic Ocean. Before, it used to take many days by ship to communicate between Britain and North America. 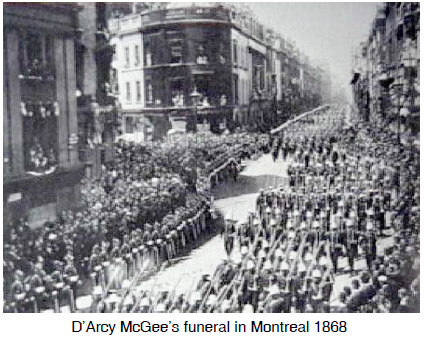 1868: Canadian member of parliament D'Arcy McGee was assassinated by fanatical Irish nationalists (the Fenians). 1868: The Dominion Police were created in 1868 in response to the assassination of McGee. Their duties included guarding the parliament buildings and operating an intelligence service that infiltrated the Fenian Brotherhood. They also protected the naval bases in Halifax and Esquimalt and in 1911 set up a fingerprint division. During World War I, they helped enforce the War Measures Act. On February 1, 1920, the Dominion Police merged with the Royal North-West Mounted Police creating the Royal Canadian Mounted Police.